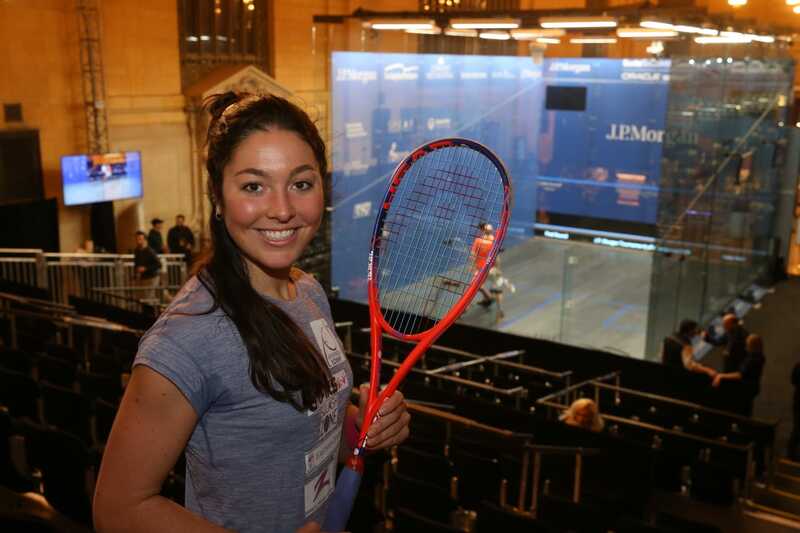 On the eve of the Tournament of Champions, US No.1 Amanda Sobhy has announced a switch to Head Rackets. In a no-strings-attached interview, Amanda explains how the deal came about and reveals her ambitions for herself, and American squash. Q: Hi Amanda. Congratulations on the new contract with Head Rackets. How did it come about? A: My contract with Harrow ended at the end of April last year and I wanted to wait a bit and sift out the market to figure out which company would be the best fit for me moving forward. To be honest, Head wasn’t on my radar until Daryl Selby, who managed my racquet sponsorship, asked if I was interested in Head. There was no reason not to be interested in Head, so I said sure. Q: What will be the main benefits for you, on and off court? A: I wanted to partner up with a company that was progressive and growing because that is how I view my own brand. It is also why I waited so long to figure out which company I wanted to partner up with. Head is looking to sponsor the top players, so I felt like this is great time after coming back from my injury to partner up with them. Q: Will you have a signature Sobhy racket? A: I really hope so! I loved having my signature Harrow Sobhy racquet, so I hope I can do the same with Head. Q: The Tournament of Champions is coming up soon. You enjoyed an emotional return last year … please (briefly) talk us through the past 12 months. A: It’s crazy to think that a year ago I was only just coming back on tour! Even though it’s been almost 2 years since my injury, the journey to just come back and then the journey to regain that confidence is so long! I didn’t know what to expect coming back on tour, but I just kept at it and enjoyed the fact that I could compete again. I think being out for so long with a brutal injury like an Achilles rupture makes you appreciate your body a lot more. Q: So many players have used that time out to analyse parts of their performance. Did you do anything like that? Q: While making that return, and climbing back up the rankings, what gave you the most inspiration to put in the extra hours and the hard yards? A: It’s that motivation to prove to myself and everybody that you can come back stronger after an injury. Q: Please tell us about your training base and coaching / fitness / conditioning schedules? A: I am based in Boston where I’ve been since I graduated university in 2015! Thierry Lincou is my coach, and Micah Logan is my fitness coach. Training schedule is usually Mon, Wed, Fri morning session with Thierry, Tuesday and Thursday morning fitness session with Micah that is very squash specific based fitness. Then in the afternoon I’ll rotate between a ghosting session, practice match, drills and conditions with someone, interval bike session. Monday-Friday from 5-7pm I have MIT men’s squash practice where I am the assistant coach under Thierry. Sat afternoon and Sunday I take completely off, which is very much needed. It’s a lot, but I love it and I’ve gotten to really love coaching the MIT team. Q: From an American perspective, it was great to see the recent British Junior Open victory by Marina Stefanoni. You were runner-up to Nour El Tayeb in 2011 and I was there in Sheffield to see Michelle Quibell win the Under-17 title in 2001. How significant is this victory by Marina? A: It’s huge to see Marina winning the British Junior Open! It shows the level of squash the US is producing. Years ago, it was the one off win with Michelle Quibell & Olivia Blatchford winning titles, but now you have the US sending around 50 players to the event and a lot of them are making it to the quarters or further. It’s absolutely fantastic to see! Q: I saw you had a lovely family holiday in Portugal recently. It looked nice and sunny. For fans flying over to the ToC from London, what’s the weather forecast like for New York during the ToC? A: There’s supposed to be a massive snowstorm coming this weekend!! Winter is upon us! Q: What advice would you give travellers to keep warm while in NYC? A: Bring lots of layers… and snowboots! Q: What are your targets for the remainder of 2019? A: I’m right at the cusp of the Top 10 now, so I am pushing hard to get back into the single digits. I think provided my body is healthy and I’m excited to compete, then anything is possible. Amanda, thank you and good luck at the ToC.